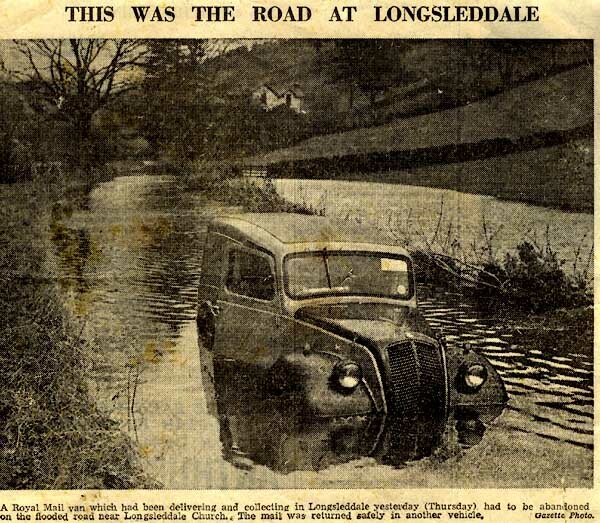 Miscellany 4 - Floods in Longsleddale since 1749. 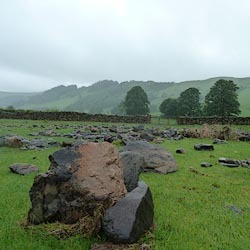 Black Thursday, 28th June 2012, stranded tups near Wadshow - but no casualties! 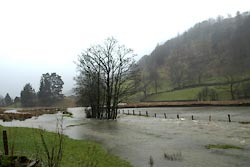 Storm Desmond, 4th-6th December 2015: heavy rain fell continuously for 38 hours, a total of 262mm (10.31 inches) at Sadgill, which included 215mm (8.46 inches) on 5th December. After a very wet November the fields were already sodden, so the rain just ran off. 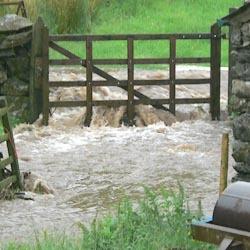 Meteorologists described this event as an atmospheric river, thin but very long, which focussed directly onto Cumbria. 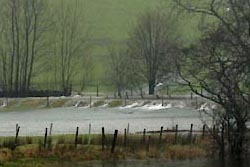 Amongst other places in the county, Kendal was badly affected, with the worst flooding in living memory. December continued very wet, with 927mm (36.5 inches) at Sadgill, making the total rainfall here 3580mm (140.95 inches) in 2015, only half an inch less than record-breaking 2012. Typical heavy rain, easing off after a few hours. Massive total rainfall, the result of steady heavy rain all day and all night. The reason for this dramatic event was not the amount of rain in total that day, but that so much fell in one hour! 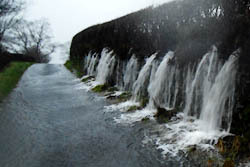 Black Thursday, 28th June 2012: The rain on 28th June 2012 was quite different, a local cloudburst. 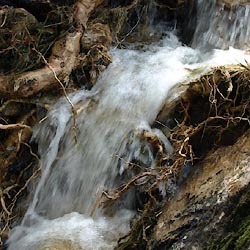 Water cascaded down hillsides scouring out tracks and streams to bedrock, demolishing walls and scattering the stones, flattening crops, flooding houses. The river rose high, over Wadshowe Bridge, and a wave of water racing along the road overwhelmed a visitor's car. 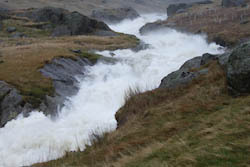 Raging torrent in Stockdale Beck, 6th August 2002. What rain you get depends very much on where you live. 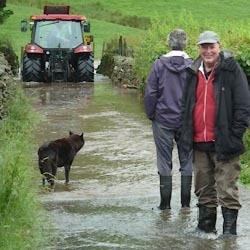 Over a year there can be 25% more rain at Swinklebank than at Murthwaite, and at Sadgill 50% more. Moreover each rain-storm is different, concentrated on one side of the valley, or on a particular fell, swelling different streams, causing different problems. Sometimes the contrast is startling. 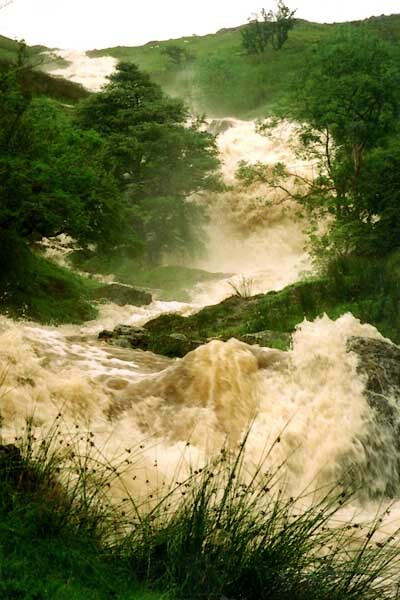 On 6th August 2002 there was bright sunshine at Tills Hole, whilst just a mile to the east a violent storm caused Stockdale Beck to break its banks in a spectacular way! 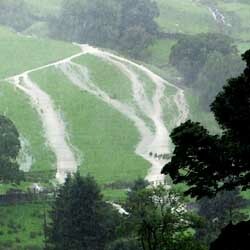 "... At Dale End, Longsleddale, considerable damage has been done. A breast wall three roods long was demolished, also a quantity of fence walling. 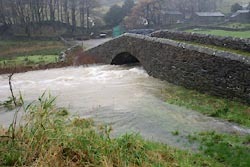 The beck was so full that it quite covered the bridge. 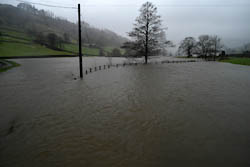 The roads in Longsleddale were quite impassable; near the vicarage the river overflowed into the road and was still there on Thursday. Right up to the top of the valley fences and light bridges have been carried down, and much damage done. 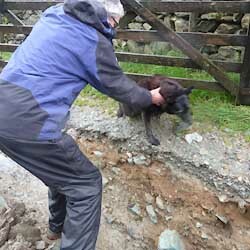 On the Flatts above Sadgill the stream was a big lake, whilst the effects of the ghylls down the hillsides was very fine." "School was not opened yesterday. 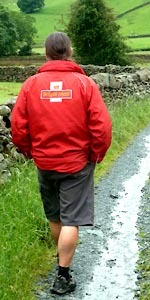 The roads being in many places knee deep in water, neither children or I were able to cross." Petition, Michael Mattinson, John Airey and James Anson of Sadgill, Longsleddale, being liable to repair the highway from Kentmere to Longsleddale Head about 14 years ago built a stone bridge at their own expence over the ford at Sadgill, and received a gratuity of �5 from Mr Dennison High Constable of Kendal ward, said bridge "abt September last by very violent & sudden Rain was intirely destroy'd & the Corn Hay & other goods of Your Petre were damag'd to the Value of �100 & upwards." Desire bridge may be rebuilt or assistance. The exact date of the Longsleddale storm is not recorded here, but on 22nd August 1749 there was a famous and well documented storm south-east of Threlkeld which caused very dramatic floods in St.John's and at Walthwaite.